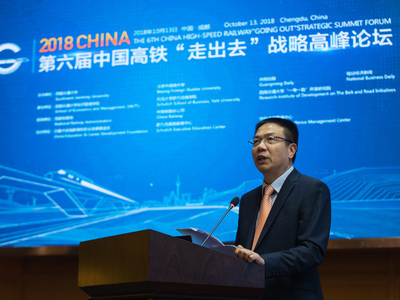 Oct. 17 (NBD) – International education platform Sino-Canada Excellence Management Center was launched on Saturday at the sixth Summit on Globalization Strategy of China's High Speed Railway. The Summit, held at Southwest Jiaotong University in Southwest China's Chengdu city, has attained increasing achievements and wider influence since its establishment in 2013. The Sino-Canada Excellence Management Center is jointly initiated by School of Economics and Management of Southwest Jiaotong University, Schulich School of Business and Onria Education & Career Development Foundation. The center will focus on building business platforms for upstream and downstream enterprises along the rail transport industry chains of both countries, promoting each other's development. Southwest Jiaotong University, in terms of national awards received in the field of rail transport, ranks first among China's universities, research institutes and industry enterprises. The university's School of Economics and Management has rich resources in local management training as well. As a co-founder, the Executive Education Center of Schulich School of Business, Canada's preeminent business school, has rigorous academic research and solid industry training experiences. It will help the Sino-Canada Excellence Management Center become a center for management research and high-level talent training, providing consulting and training services to the two countries' governments, enterprises, educational organizations and business associations in the future. Integrating think tank resources from China and Canada into an international platform can help spread advanced methods of management and training. More importantly, it will not only help Chinese enterprises "go global", but also bring in high-quality overseas enterprises. NBD noticed that the Sino-Canada Excellence Management Center has already conducted research on topics like improvement of government administration and leadership, assessment of innovation and entrepreneurship potential, and global perspective for Chinese enterprises. For the last decade, China's high-speed railway has not only connected the whole country, but also entered the global stage. As Xu Fei, president of Southwest Jiaotong University, put it, China's high-speed railway has become an important engine in pushing forward the Belt and Road Initiative and building a "community of shared future" for mankind". But Xu also pointed out that the globalization of China's high-speed railway industry is still facing a lot of uncertainties and regulative risks. He advised the Summit, which is being developed into an influential think tank, to further explore the following questions in the future. The first is taking specific measures in accordance with policies of different countries to respond to, circumvent, regulate and solve existing and potential risks faced by high-speed railway's overseas endeavors. The second is exploring ways to maximize the overall strengths of China's high-speed railway industry, and enhance assembling ability of the industry chain, thus make the industry more competitive globally. Other important issues include improving policy support to facilitate the globalization of China's high-speed railway industry, and promoting shared prosperity, especially inclusive development for less developed countries and emerging economies. The seventh Summit on Globalization Strategy of China's High Speed Railway will be held in Canada next year.